The Ezee Points Loyalty Scheme is only valid on the ezee-quit.co.uk website. 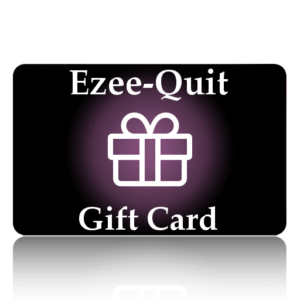 The allocated points are personal to the account holder of the Ezee-Quit website account. Points cannot be transferred to any other person or account. The Ezee Points Loyalty scheme is only intended for personal use. Points cannot be collected for use by a business. Ezee-Quit DO NOT accept any liability for loyalty scheme accounts that have been misused by the account holder. Ezee-Quit reserve the right, at any time, to end the scheme or decline any issue of membership without notice. Ezee-Quit reserve the right to take appropriate action if we feel the scheme is being abused, including withholding points previously earned. Ezee-Quit reserve the right to modify our terms in any way we choose. Any changes to the terms will not effect points that have already been collected. Ezee Points cannot be credited to guest checkout orders. You will be rewarded 1 point for every £1.00 that you spend in any single transaction (points round up to the nearest £1.00 so 99p will earn you 1 point). Ezee-Quit reserve the right to amend the value of points and number of points allocated at our discretion. Ezee points will be cancelled or deducted should any items be returned to us or where a refund is requested. Ezee-Quit Ezee Points cannot be exchanged or redeemed for cash. All Ezee Points are valid indefinitely and will not expire no matter how long you have them in your account.